I think I saw him on the VMAs or something and I'd totally hit that. 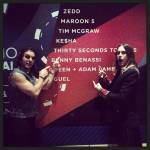 according to his twitter he was at the iheartmusicfestival.com w/his bro Shannon complete with an instagram photo showing surprise that they are on the bill. On his website he refers to his fans as friends and has Greek Orthodox or Byzantine Catholic (your choice) crucifix as his favicon. In other words it looks as he has a rich diverse life in which urban bicycle riding is another piece of fruit in his basket of experiences. Easiest 300 bucks of my life. the best best (yeah twice i said) cat trip image i have seen all day. thank you.